e-Court is an independent group of professionals like (former) arbitrators, lawyers, barristers, solicitors or attorneys, judges, university professors, industry and other legal interest groups. e-Court aims to provide competent, affordable, secure, transparent and speedy justice for everyone. 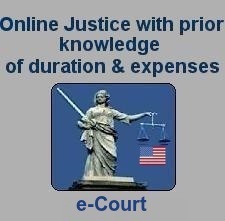 e-Court also provides an uniform litigation system throughout the USA, Canada and other countries without the need to understand the peculiarities existing in each area's legislative system. Labor disagreements and other civil disputes between businesses and/or individuals can be submitted to a real Internet court. This new private court guarantees ruling within six weeks after notification of the case. The verdict of e-Court is based on contract principles ( e.g binding arbitration ). e-Court cases take no more than six weeks (excluding an appeal of four weeks). This makes the process to cost much less than ordinary courts, where to obtain a ruling in most countries takes on average between 70-90 weeks.